Credit utilization ratio is a key factor in determining your credit score, so it’s crucial to understand how it works. After all, a great credit score can qualify you for higher loan amounts and lower interest rates, while a low credit score can make it difficult to reach your financial goals. How is credit utilization ratio calculated? Credit utilization measures the balances you owe on your credit cards relative to the cards’ credit limits. If you never use your credit cards and there’s no balance on them, your credit utilization would be zero. If you typically carry a balance on one or more cards, you are ‘utilizing’ some of your available credit—and credit score providers will take note. Credit utilization is a key piece of your credit score puzzle. Both FICO and Vantage, two big credit scoring agencies, list credit utilization as the second highest factor they consider when determining credit score. If your utilization ratio is high, it indicates that you may be overspending—and that can negatively impact your score. We’ll talk more about what a good credit utilization ratio is in a moment. 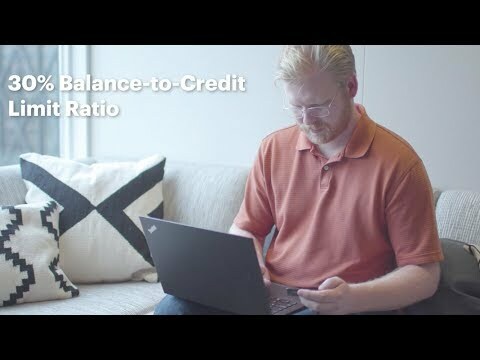 Credit utilization ratios can be calculated for each credit card (card balance divided by card limit) and on an overall basis (total balance on all cards divided by sum of credit limits). The general rule of thumb with credit utilization is to stay below 30 percent.1 This applies to each individual card and your total credit utilization ratio. Anything higher than 30 percent can decrease your credit score and make lenders worry that you’re overextended and will have difficulty repaying new debt. Experian finds that credit utilization ratios vary by age group.3 The Silent Generation averages 16 percent, followed by Baby Boomers at 29 percent, Gen X at 36 percent and Millennials and Generation Z at 37 percent. Interestingly, younger groups tend to have lower balances than their elders — but their credit limits are also lower, so their credit utilization ratios can still be high. If you think your credit utilization ratio is holding your credit score down, you can use these five strategies to improve it. 1. Pay down debt. Reduce your credit card balances by paying more than the minimum each month. Consider making two or more payments on your credit cards throughout the month – even small extra payments can speed up debt payoff and help keep your utilization ratio throughout the billing cycle. Just make sure to avoid charging more on your cards. 2. Refinance credit card debt with a personal loan. Refinancing credit card debt with a personal loan can help in more than one way. First, consolidating multiple credit card balances into one (ideally) lower interest rate loan can reduce the amount of interest that you’ll pay on that balance over time, which means you can pay more toward principal and eliminate the debt sooner. Second, many people find it easier to stay on top of a single monthly loan payment instead of multiple credit card payments. Lastly, if your credit cards remain open after transferring the balance to a personal loan, your credit utilization ratio goes down. If you keep the credit cards open and don’t run up a balance on them again, that can help your score over time. 3. Ask for a higher credit limit. You can also reduce your credit utilization ratio by asking for a credit limit increase on one of your cards. In a recent survey, CreditCards.com found that 89% of people who ask for a higher credit limit get one.4 For example, let’s say you have a balance of $8,000 on a card with a $10,000 limit. Increasing the limit from $10,000 to $15,000 would reduce your credit utilization ratio from 80 percent to 53 percent. Again, it’s key to resist the temptation to spend up to the new limit. 4. Apply for another card. Another way to increase your total credit limit is to apply for an additional credit card. A word of caution: while applying for an additional credit card is one way to reduce your credit utilization ratio, opening a new credit card may not improve your credit score. Having more credit cards may tempt you to spend more than you can afford to pay back, which can wreak havoc on your financial health (not to mention your credit score). Additionally, a new credit card, similar to a new personal loan, will add to your number of new accounts, which can also ding your credit score. 5. Leave cards open after paying them off. By paying off the card, you’re reducing your total balance. By keeping the card open, you’re maintaining your total credit limit—thereby lowering your credit utilization ratio. Keep in mind that taking out a personal loan to consolidate credit card debt, asking for a higher credit limit on your card, or applying for another card may all involve a “hard inquiry” on your credit report, which can ding your credit score. Now that you know how to improve your credit utilization, it’s important to keep track of your progress. Check your credit card balances monthly and keep tabs on your utilization ratios. Many card issuers offer balance alerts via text or email, making it even easier to prevent your utilization ratio from creeping up. Monitoring your credit score can also provide motivation to keep your utilization in check. Credit utilization ratio is just one factor that goes into your credit score, but it’s an important one. Keeping your credit utilization low can increase your attractiveness to lenders and get you access to better rates and larger loans. If you’d like to learn more about the factors that go into your credit rating and how to manage your debt more effectively, visit our Credit Health Insights. To access your free credit score and other credit monitoring tools and resources sign up for Upgrade’s Credit Health.